I love a good bowl of oatmeal for breakfast any day of the week, but sometimes it’s fun to take a little extra time to make something different on the weekends. My first choice would always be thick, fluffy French toast with strawberries and fresh whipped cream, but when I’m trying to make healthier choices, I usually go for an omelet or scrambled eggs. Still, what’s breakfast without carbs? Adding these skillet sweet potatoes is a great way to make a super filling and satisfying healthy breakfast. Inspired by classic eggs and hashbrowns, I first made this spicier version for brunch on Sunday. I love the fact that skillet sweet potatoes and eggs only use one pan because it’s easy to clean up. So easy, actually, that I might make it in the dorm kitchen this upcoming school year. Speaking of which, I move back to school in exactly one month from today. Summer’s moving too fast! For this simple meal, I sautéed the sweet potatoes with red bell pepper, red onion, garlic, and spices. The potatoes take around 15 minutes to cook, which was just enough time for me to unload the dishwasher, beat some eggs, and touch up a chipped nail– all of the important things. Once the potatoes were soft on the inside and beginning to crisp on the outside, I transferred them to a plate and added the eggs to the skillet to scramble. Once the eggs were done, I added the sweet potatoes back to the skillet so they’d be piping hot, although in the 2 or 3 minutes it takes to scramble the eggs, they didn’t cool off much. I actually made this meal twice, once for brunch on Sunday and again for dinner last night. The first time I made it, I just pushed the sweet potatoes to the side with a spatula and added the eggs right to the skillet at the end. That method worked fine but the skillet did get a little crowded so I recommend the temporary-relocation-to-a-plate method. Excuse my slightly crispy scrambled eggs. I fear soft, runny eggs above everything else. Instead of scrambling the eggs, you could also make several divets in the sweet potato mixture and crack whole eggs into the skillet, replacing the lid to let them steam for “sunny side up” instead of scrambled eggs. I didn’t take this route because of my runny egg issues, but I bet it’d be delicious if you’re into those. I topped mine with salsa verde because I love salsa on eggs but avocado would be delicious, too. 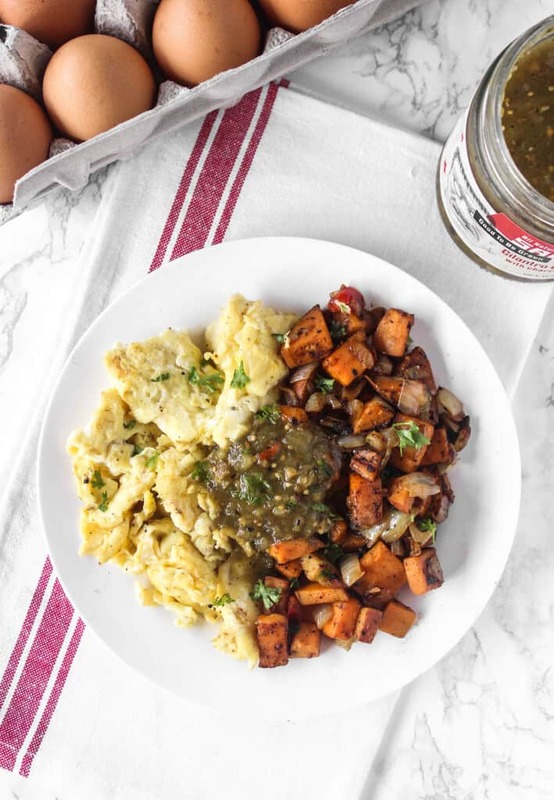 So there you have it– my new favorite healthy weekend brunch or breakfast for dinner (brinner!) meal. For topping/garnish: salsa or salsa verde diced avocado, fresh parsley or cilantro, etc. 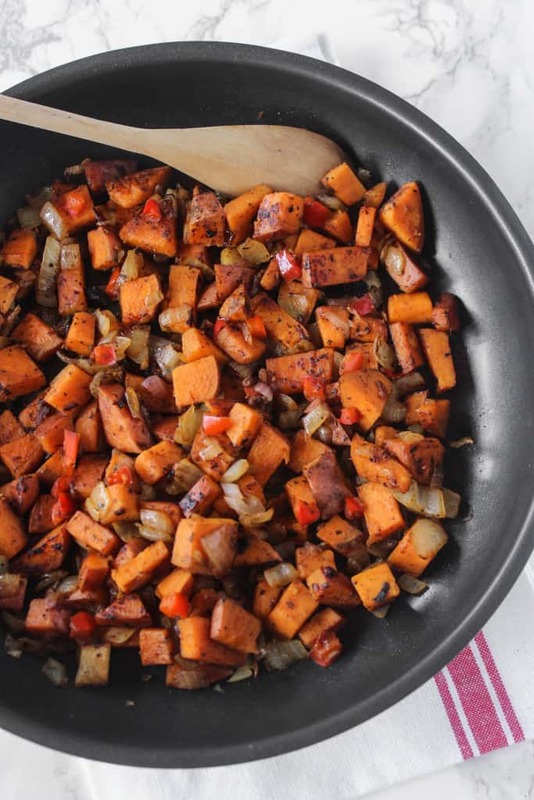 In a large skillet, sauté the red onion, sweet potatoes, and red pepper in cooking oil over medium heat. Add cumin, salt & pepper to taste, and red chili flakes or cayenne pepper while cooking. Cook the vegetables for 15 to 20 minutes over medium heat until sweet potatoes begin to soften. If skillet becomes dry while cooking, add water a tablespoon at a time to help steam sweet potatoes and cook all the way through. Once sweet potatoes are soft and beginning to crisp, transfer to a large plate. If any charred black bits remain on the bottom of the skillet, wipe the skillet out with a paper towel. Add a pat of butter or small spoonful of oil to the skillet and add beaten eggs. 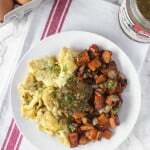 Once scrambled, return potatoes to skillet to reheat, if necessary, and then serve immediately. Top with salsa or salsa verde and sprinkle with chopped fresh parsley or cilantro, if desired. If you prefer sunny side up eggs over scrambled, make several small divets in the sweet potato mixture and crack in as many eggs as you'd like. Put the lid on and allow the eggs to cook for about 3-5 minutes until the whites are set and the yolks are still runny. What’s your favorite healthy breakfast and your favorite decadent breakfast? Are they different? I am all for one pan meals and this looks perfect! I’m with you– no poached, fried, or boiled eggs for me! Sounds like the perfect breakfast to keep you going through the day! LOVE this breakfast! I make a variation of it almost every morning, although I like runny eggs 🙂 One pan/skillet meals are the way to go. Agreed! I’ve been ALL about one-pan meals this summer. One pan skillet meals are just the best! Sweet potatoes and eggs are one of my favorite combos! 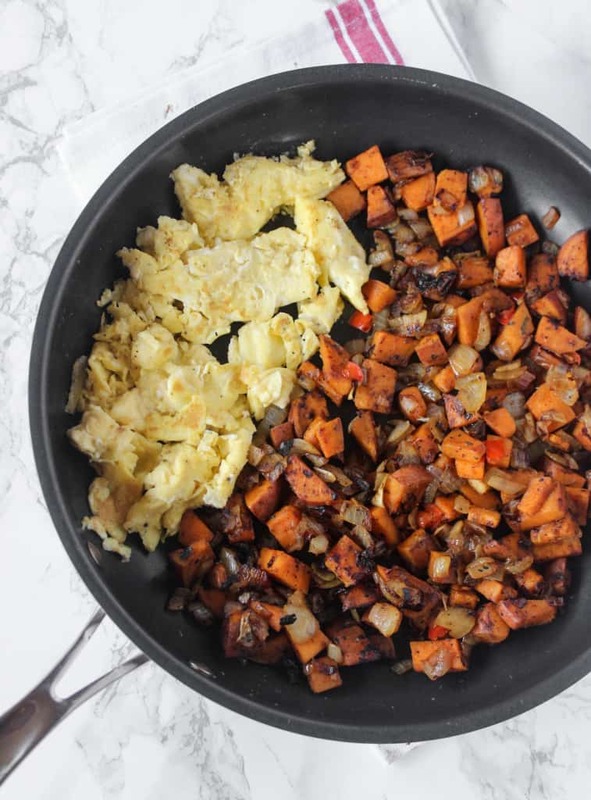 I thought sweet potatoes and eggs sounded like a strange combo the first time I tried it, but it’s so good– just like white breakfast potatoes or hasbrowns with eggs, but even better! We make something like this with white potatoes. Have to try it with sweet potatoes this Saturday or Sunday. this looks so good!! i’ve never cooked sweet potatoes from completely raw in a skillet, but it would save soo much time instead of roasting them. definitely going to give this a shot. my fav breakfast to eat on the weekends are egg breakfast sandwiches filled with avocado, cheese tomatoes, etc. mmm!! i do love french toast and pancakes, but this is my kind of breakfast right here!! Yum! This looks delish. My fav decadent breakfast is some stuffed french toast with maple syrup 🙂 I’ve got lots of healthy breakfast favs, one of which is eggs & potatoes so this version would be a nice upgrade from that! Mmm stuffed french toast sounds incredible! This is an amazing combo! I love having this kind of thing for dinner. I am digging all the addition of veggies you added. My favorite healthy breakfast is probably an a veggie omelet with toast and my favorite decadent breakfast is creamy grits/ eggs/ sausage! Somehow, I usually forget about grits despite living in the South, but you’re right- they’re so good and I love them whenever I do have them! Dang this looks good! I LOVE savory breakfasts and this looks way easier than a lot of other recipes I’ve seen! I just moved back to school a few days ago and need to go grocery shopping, so I’ll def be buying all of these ingredients! Wow, you moved back early! Hope settling back in is going well! I have been OBSESSED with toast topped with goat cheese, avocado and scrambled eggs…soooooooo good! What’s a breakfast without carbs- So TRUE! (Or any meal without carbs am I right? 🙂 ). I bet Curtis would love this meal, I should treat him to it one of these days if I’m feeling nice! This was great! I added a little ketchup to it!